What it’s about: In the digital age, when it seems like every movie, show, web short, or live performance is the touch of a button away, it’s easy to forget just how much of film history has been lost forever. In the days of analog media, physical reels of film had to be protected from age, decay, or simply getting misplaced or thrown away. Sadly, in the first few decades of film history, many weren’t. Strangest fact: Not only can old film stock deteriorate if not stored properly, older film stocks actually decay into a substance similar to gunpowder. Up until 1951 or so, the industry standard was nitrate film, which is flammable in its intact state, but once the nitrate breaks down, it’s so flammable it can spontaneously combust in extreme heat. As a result, every movie Fox made before 1932 was lost in a 1937 archive fire, and a large swath of silent film history was destroyed in an MGM vault fire in 1967. Studios learned the hard way that film has to be stored at low temperature and humidity, but the real change happened when a more stable stock of “safety film” was introduced in 1948. That stock tended to lose color with age, but it didn’t explode, so it was a net gain. Biggest controversy: An estimated three-quarters of silent films are gone forever, including more than 90 percent from before 1929. Once sound came along, silent films were rarely rescreened, and studios had no financial incentive to keep them. The nascent medium of film didn’t yet value its history to any great extent, and studios simply destroyed old prints to clear vault space for more recent releases. Big stars like Charlie Chaplin and Mary Pickford had the clout to keep their filmography intact, as did directors like D.W. Griffith and Cecil B. DeMille. Silent star Harold Lloyd was also a champion of film preservation, but sadly he lost a good deal of his work to a studio fire in the 1940s. Thing we were happiest to learn: As the Boss said, maybe everything that dies someday comes back. Numerous films thought to be lost forever were rediscovered years or even decades later. A print of 1910’s long-lost Frankenstein was found in the hands of a collector in the 1970s. A print of Richard III from 1912 was discovered and restored in 1996. When Gloria Swanson wrote her memoirs, she said of her lost films, “I do not believe these films are gone forever,” and she turned out to be right in the case of Beyond The Rocks, which she starred in opposite Rudolph Valentino in 1922. A copy turned up in the Netherlands in 2003. 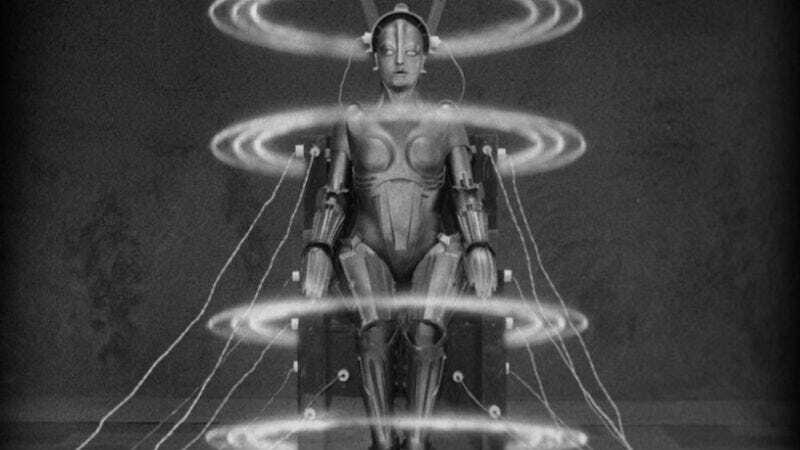 Fritz Lang’s 1927 landmark Metropolis has been cut and re-cut numerous times to cover for damaged and missing footage (a quarter of the film’s running time was considered unrecoverable), when the Museo Del Cine in Buenos Aires discovered all but one of the missing scenes in its archive, and the film has since been restored to very nearly its original state. Thing we were unhappiest to learn: Entire careers have been lost along with destroyed film stock. Theda Bara was one of the most famous actresses of her day, but of the 40 films she made, only six survive. Clara Bow is more remembered for being an “It Girl” than for any particular film she starred in—at least a third are lost, and a few more are incomplete. Many stars of the silent era who didn’t make the jump to “talkies” no longer have any record of their work. Also noteworthy: Rediscovered lost films often turn up in personal collections, and there’s a good reason for that. Early movie studios, deciding that films had little or no value after their theatrical runs ended, would sell prints of the films, either whole or in parts, to individuals who owned home movie projectors. People could screen their favorite movies at home, and those enthusiasts often ended up being the only ones who actually kept intact copies of older films. Best link to elsewhere on Wikipedia: For a deeper look into lost films, Wikipedia has lists of films that were lost, incomplete or partially lost, or lost and rediscovered. Further down the Wormhole: One striking thing about the silent film era is how many hits were later reworked with sound. Among the 10 highest-grossing silent films are Ben-Hur, The Hunchback Of Notre Dame, and The Ten Commandments, which would all spawn better-known talkie remakes. The Titanic disaster would be revisited again and again in film, but one silent movie definitively got there first: Saved From The Titanic was not only released just a month after the tragedy, it starred a bona fide survivor of the wreck, Dorothy Gibson, an American actress who had escaped on the first lifeboat. She co-wrote the script, and the film was hastily shot in New York Harbor, although the last known print was destroyed by fire in 1914. Wikipedia has an exhaustive list of Titanic stories, including that of Sidney Leslie Goodwin, who died in the disaster at the age of 19 months. His body was recovered but unidentified for decades, until a DNA match was found with a surviving relative in 2008. Goodwin’s story in turn leads to a long list of “unidentified decedents,” none stranger than the Salish Sea human foot discoveries. We’ll look at that macabre story next, as The A.V. Club dives into its annual Horror Week.